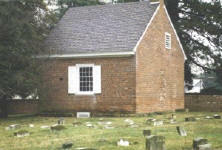 The Delaware Public Archives operates a historical markers program as part of its mandate. Markers are placed at historically significant locations and sites across the state. For more information on this program, please contact Russ McCabe at (302) 744-5000. Location: Odessa – Approximately 1/8 mile west of the intersection of Route 1, and Route 299 (Main Street) south side of Route 299. 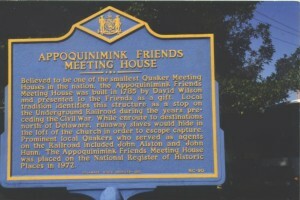 Appoquinimink Friends Meeting House listed: NPS Underground Railroad Special Resource Study 1995.